This rare whisky may not be the most expensive Scotch whisky in the world, but it may just be the most expensive whisky on the market. 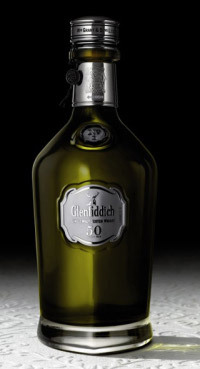 It’s called Glenfiddich 50 Year Old and it costs $16,000 for a single bottle. This golden amber Scotch, the darkest of Glenfiddich’s whiskies, is only the second vatting of Glenfiddich 50 Year Old. The first was between 1937 and 1939, when Glenfiddich founder William Grant laid down nine casks—one for each of the grandchildren who’d helped him build his distillery by hand. To create this whisky—with its delicate rose petal and violet notes and green tobacco leaf, oak and smoke flavor—two casks, each one matured for 50 years in a cool and dark warehouse, were mingled in an American oak cask by renowned Malt Master David Stewart for another six months before finally being bottled and readied for sale. Glenfiddich proudly states that “Every year counts” and we can see they take that phrase very seriously.